EPBOT: March Art Roundup: Pink Chubby Toads, Fried Egg Elephants(?!) & Octopodes On The Ceiling! 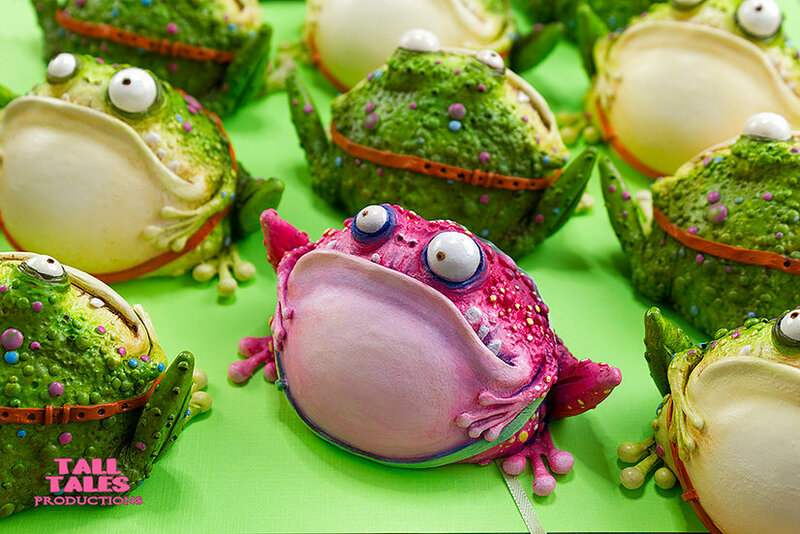 March Art Roundup: Pink Chubby Toads, Fried Egg Elephants(?!) & Octopodes On The Ceiling! This month, just to shake things up, we're going 3D. Art isn't limited to flat paper prints anyway, right? Plus I've found sooo many new sculptors I think you're gonna love. Srsly, I want them all. Look at that shine! And those sweet colors! The longer I look, the harder it is to pick a favorite. Ded. I AM DED WITH TEH CUTE. Their expressions crack me up. You think we interrupted something? And finally, you guys, I found the most phenomenal miniature sculptor. 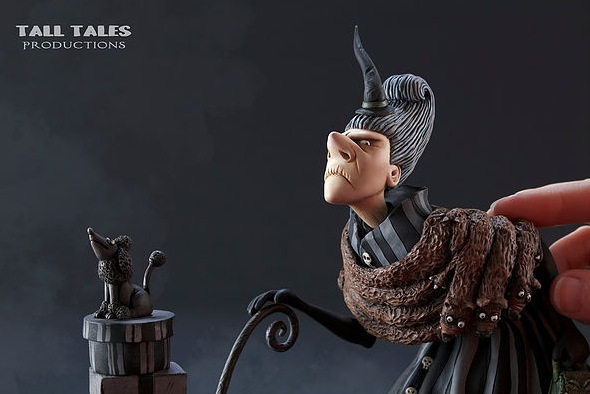 If you like the look of Tim Burton's stop-motion work, then you will go NUTS for Caroline McFarlane-Watts' new figure series, "Good Witches Bad Witches." The bunny in the basket! Hee! They're about the size of a softball, and come with tiny leashes! Go follow Caroline at Tall Tales Productions on IG for alll the eye candy, then check out her website to order. I've been trying to hold out 'til Caroline lists more blank resin toads in her online shop, so I can try painting my own, but I might cave and order a painted one. The only trouble is deciding which color: Pink or green?! Now, let's give away some art! Baby Vader is a 12X18 signed print by Nathan Szerdy. Fun fact: John and I commissioned the original of this from Nathan (which we still have), but this print version has extra digital tweaks and a full background. Nathan gave us the print along with the original, but I'd rather one of you have it! You can probably tell by the dates that I'm trying to clear out my oldest selections from the give-away board, so no wildcard option this week! Let me whittle down some of these older choices, then I'll go back to letting you choose from the whole give-away board. SO, comment below and tell me which of these three you want! (It's OK to say all of them, ha.) I'll announce my randomly selected winners in my very next post, so stay tuned. The tentacles at the beginning are amazing! I hope this doesn’t double post. Please enter me for Supergirl and Vader! I definitely just bought the fried egg elephant. I don't normally buy things like that but I fell in love with him immediately. I'm going to have him Albert. Thanks so much for sharing! Baby Vader is my spirit Darth. That rattle!!! Please enter me in the drawing for him!! I'd love to hang up Baby Vader in my classroom. Baby Vader. That Yoda doll is too cute. Please enter me for Baby Vader. So cute! That Supergirl is just too beautiful. Sign me up for that one. That Baby Vader would be amazing in my toddler’s room, but all three are fantastic! Huh - no love for the Captain? 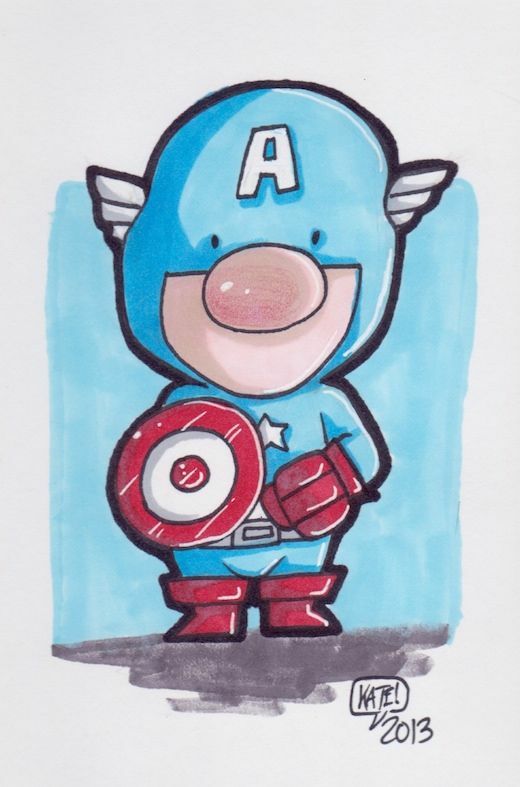 Sure, they're all great, but this Captain America is so cute! Uh, i would love loove looove the little cutie cap! I love the witch figures. I would love to be entered for the Supergirl one, thank you. Ha! Octopodes is my new favorite word since I spent about 20 minutes yelling at the moron on NPR's Science Friday for saying "octopuses". I mean, come on, this is NPR, refuge of the geeks, nerds, pedants, and grammarphiles. There should be no improper pluralization from these scientists!! Then I got my comeuppance when the host of the program questioned that very thing and I learned that "octopi" is an improper assumption of a Latin ending to what is really a Greek word and the "i" is not correct at all. Octopodes is the proper Greek pluralization and I've been smugly erroneous my whole life. Now I take great glee in setting the record straight, especially to my fellow word nerds. Keep up the nerdliness, my sister in grammar. I can always count on you to have the apostrophe in the proper place. I want all of them! I think my daughter would especially love it if I won Captain America or Supergirl, but baby Darth is so cute, too. 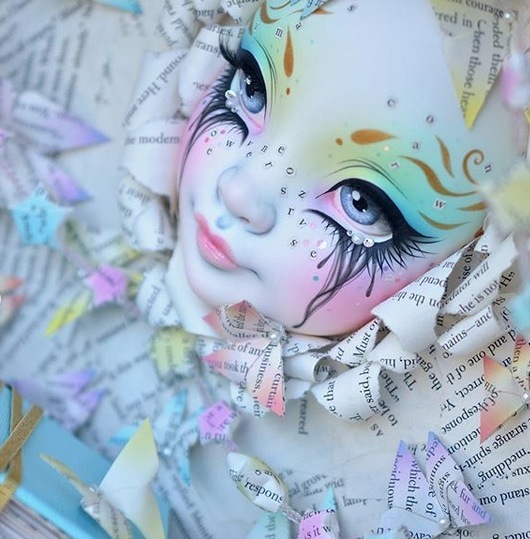 Normally I find porcelain dolls creepy, but I think the first two you featured are winning me over a little. Baby Vader is the most adorable Vader, that death star rattle! Baby Vader definitely! He is soo cute, love the Star destroyer cookie with the one bite out! 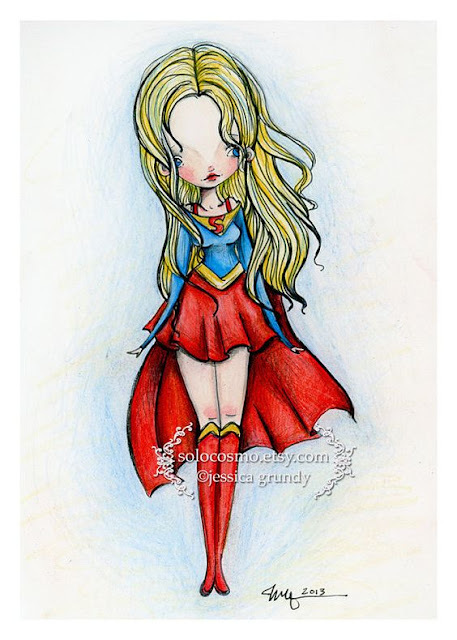 I would love the Supergirl print for my granddaughter. She's going through a rough time right now and I think it would remind her how great she is! Thanks! I am in love with that baby Vader print and want it for my baby's nursery...or possibly my room ;). Baby Vader for the win! Totally love the facial expressions on Rioky's creations. I think I've seen our fur babies with similar looks after they have been naughty. All of those fab sculptures! Thanks for sharing. I would love to give Cap a new home (or Baby Vader). 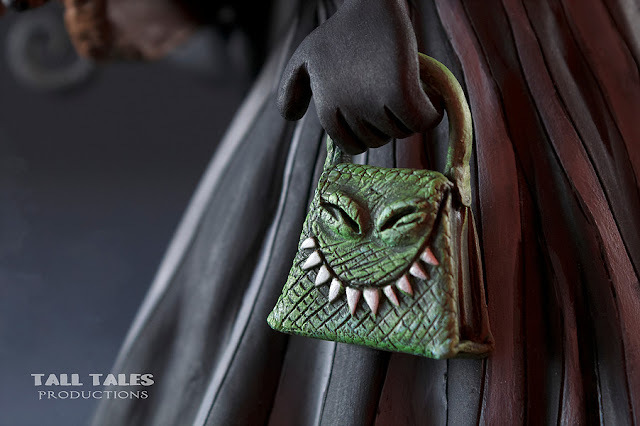 All stunning (and creepy) pieces! Cap would look great in my office! Thanks for sharing--that work by Shayne Greco is awe-inspiring. LOVE the Darth Vader baby! He was such a cutie! Very cool art--as usual!! Thank you for curating these posts; I enjoy them so much. Please enter me in the drawing for cutie Cap! I would seriously be happy with any of the three! And you did it again with the fabulous art! I would love any of the three prints! 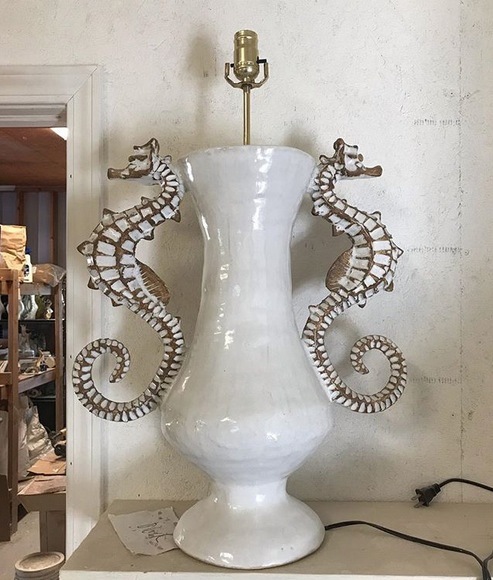 That octopus chandelier is AMAZING! I would LOVE that Darth Vadar print! My son would go nuts! Off to find it on Nathan Szerdy's website. Please, please, please put me in for that adorable baby vader! I want ALL OF THEM. But I'm particularly into that Cap. Grabby Hands! I want ALL! (But I will happily and graciously take any!). SO MUCH TALENT! Thank you for sharing and continuing to introduce me to new artists! I would love to have the baby Vader. Thank you! Put me on the list for Baby Vader, please! Some fabulous fines this week! Would love to be entered for Darth Vader or Captain America. Gosh, I just love the Vader one! It's amazing! AH! I WANT 'EM ALLLL! 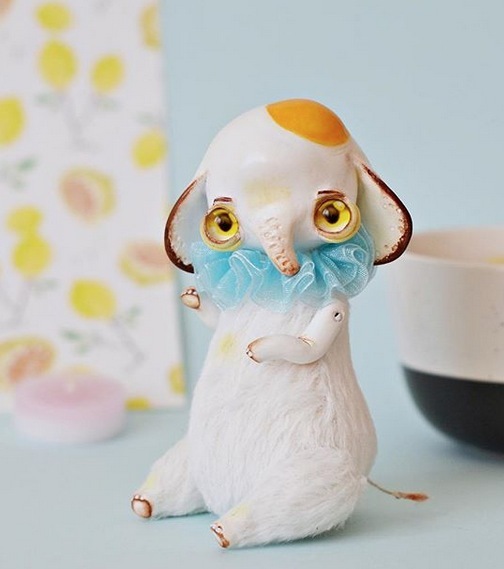 Daaaaang that fried-egg elephant, I need one. I'd love to be entered for the baby Vader, but honestly, I'd be thrilled with any of them. All three pieces of art are amazing and I would love to be entered for all three. Thanks for the giveaways! Vader or Cap, please. Fun stuff all around! I'd love to be entered for all 3. And holy cow, those beautiful dolls! Oh, be still my heart! So many cuties in this roundup!!! Please enter me for all three draws, they’re all favorites! Please sign me up for all of them! Now that I'm finally working on making/refinishing frames for the art we have, I have room for more :)! Little Vader <3 (But I'd be happy to win anything.) Thanks for doing a give-away! I'd love to win Baby Vader. :D SO cute!! Oh please put me down for the Baby Vader and Cap! I love them. The porcelain faces are super creepy, but the toads on leashes are adorable!! I can't choose! I'll take any of the three. They're all fabulous! 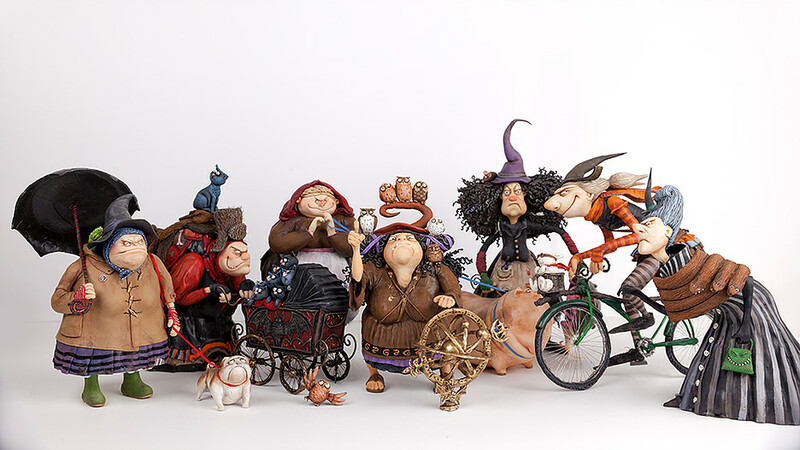 Those witches instantly remind me of Terry Pratchett's Discworld! So much awesome! I love the doll head art! And much of the other stuff including the toads ^_^ You find all the cool stuff. I would like to be entered in the Supergirl and Baby Vader contests, thanks so much! I'd love to be entered into the running for all of them! I love me some Baby Vader! Captain America or Star Wars please! Great collection! I didn't find the porcelain pieces creepy, they were too pretty. ;) Baby Vader is the BEST. One of my best friends would fanboy alll over that!! I'd love that for him. Please enter me in all the drawings. You’re the bestest!! 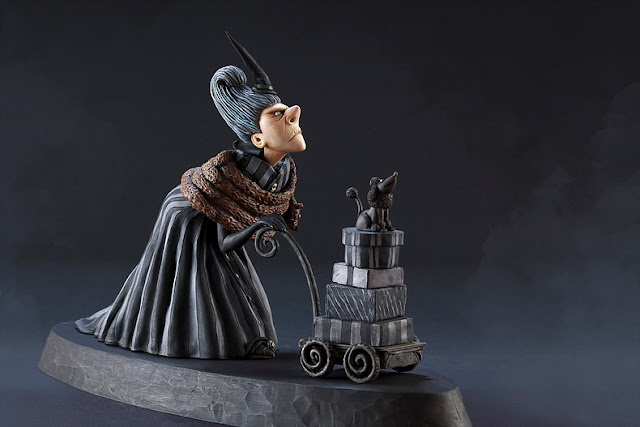 I love sculpture, though I’m usually looking for more 3D wall art than desktop/shelf style. These are all great!! 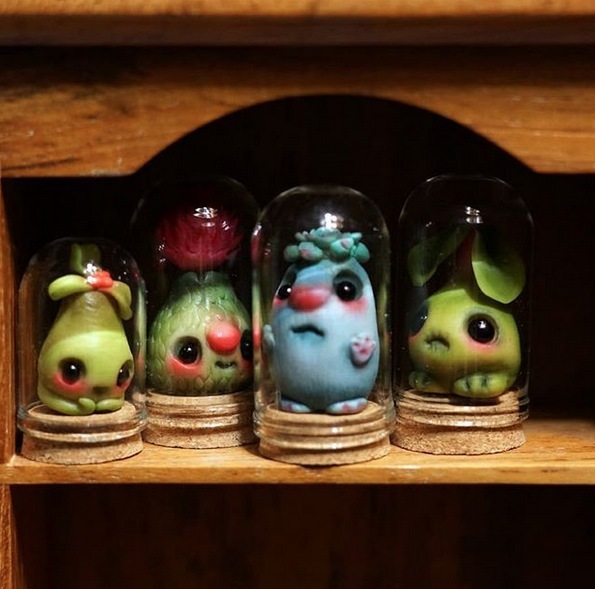 OMG all of them are so cute! I would love them all. Your finds are spectacular, as always. I literally gasped when I saw the octopus! I'd love any of them 😍 especially Supergirl for my daughter or Cap for my son. They're brilliant and colourful and strong and fun just like the pictures. But we're in Sweden, so perhaps shipping is an issue? I'd love Baby Vader. Also, I fear that Shayne Greco shall take all my money, but my beachy themed home will be much more fabulous. So much good stuff on the giveaway board! Any Wookie the Chew prints, Baby Vader, or Vader walking the at-at are my choices! Anything Star Wars AND cute basically fries my impulse control. I'd love Baby Vader - and did someone mention Wookie the Chew?! Oooo I want baby Vader please!!! I like the Supergirl one best by a tiny bit. 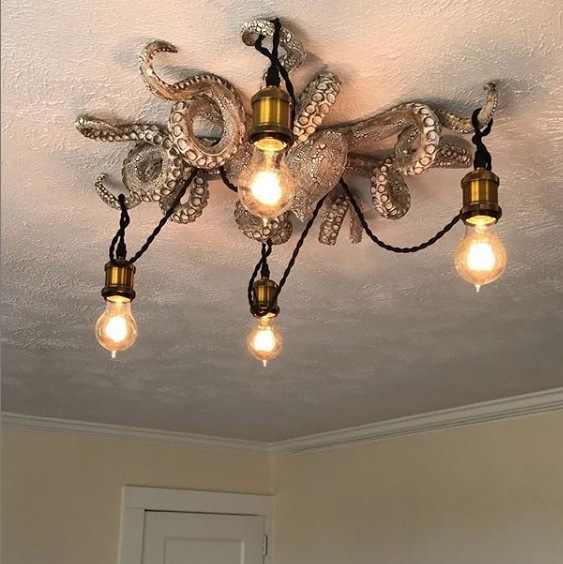 The octopus chandelier is fabulous! I would love either the Supergirl or the Captain America, please! Either Cap or Baby Vader, please. Cap for me, Baby Vader would be a perfect birthday present for a friend. Oh my god that captain America is ADORABLE! my niece would love it. I’d love to win it for her! The Baby Vader. I am a huge fan of Nathan Szerdy! I’m desperate for that Baby Vader! I started making a “movie wall” in my kids’ playroom, but it ended up just being a Star Wars wall (apparently I’m more of a fan girl than I thought). I have the perfect spot for a print! And that Chandelier?? LOVE!! I'm a total sucker for anything Octopus related. Tall Tales is now on my favorites to watch list. Wow. Have you read Pepper and Carrot? I don't remember if I found that site via you or a comic artist. Reminds me of the older witches in that one. ^_^ That Cap piece is one of my favs from the board as is! 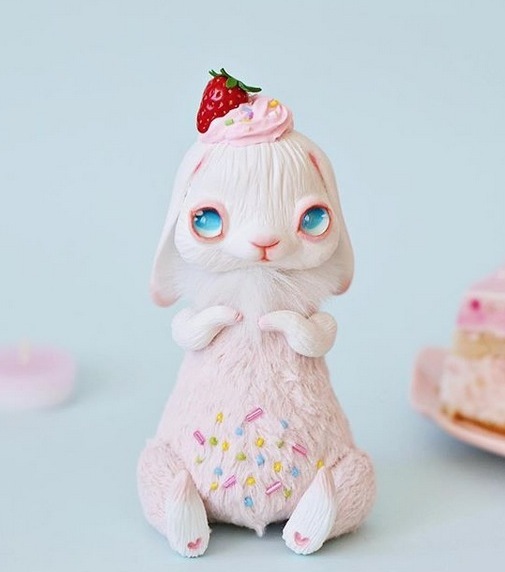 How cute are those buns! I would the baby Vader or the cap! Love it all so please enter me times three... and now I have to go spend more money - thank you! Darth Vader’s Yoda doll is calling my name!! Vader should not be this precious. I loves him! Would love the Vader print in my Star Wars bedroom. Like all 3. Would enjoy any of them. 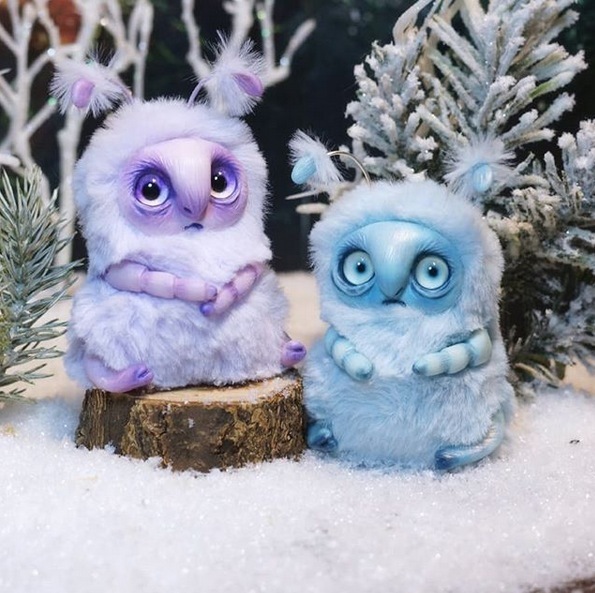 Those doll faces are interesting but mostly a big fat nope from me. The octopus chandelier is an amazing thing of beauty. I love this foray into 3D art. I would love any of the 3 prints you are offering this month. thanks! 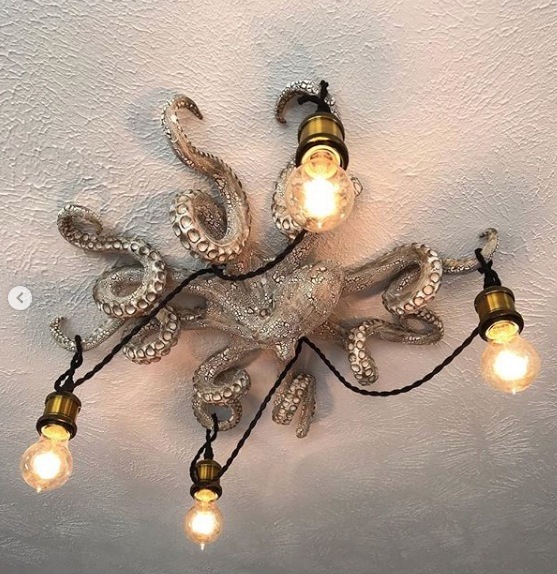 "Octopodes on the Ceiling" would be a great band name, just saying! Oh, Baby Vader for me! I very rarely enter these, but I gotta have Cap! And you're right, those toads are AH-MAZING! All of them yes! And they'll go to TC-8 which is why I'm breaking my Lent rule. please enter me for baby vader and supergirl. thanks for the giveaway! The captain america is just too cute but I also love the vader! That baby vader! My BFF is pregnant and I'd give it to her! Vaderrrrrrrrrrrrrrrrrrrr! Ok, but I really love them all, but look at that shiny little helmet??? Ahhh. I love them all, but Vader is the BEST. I can't with how cute that is! I love them all, but especially Vader! Such amazing artists! The Vader is adorable. 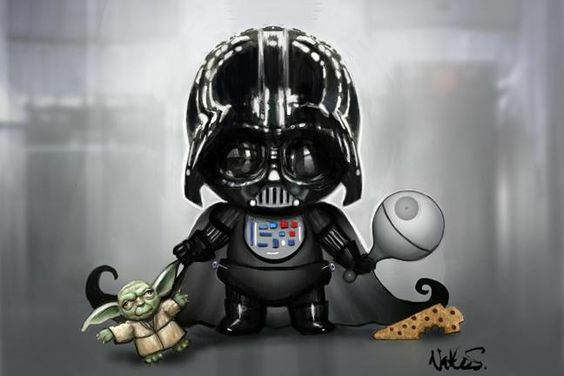 Oh, I would LOVE Baby Vader! Thanks for considering me! Supergirl is fantastic. Neeeeeed. Thanks so for highlighting this lovely art. I bought the rainbow rocket from an earlier post. Baby Vader! Cap! and thank you for Octopodes. :) be well. I would love to have super girl for my own little super girl! The Darth Vader one is so stinkin’ cute! Since I already own Supergirl and Wonder Woman....I have to say I love little Darth! I would love to add Cap to my collection - he's adorable!!!! 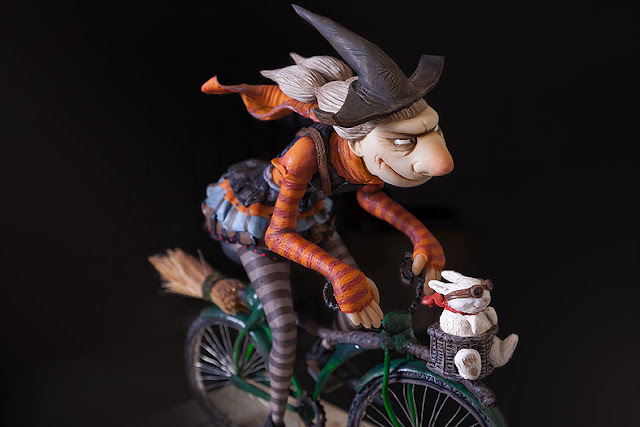 Loving the textures on those witch sculptures! 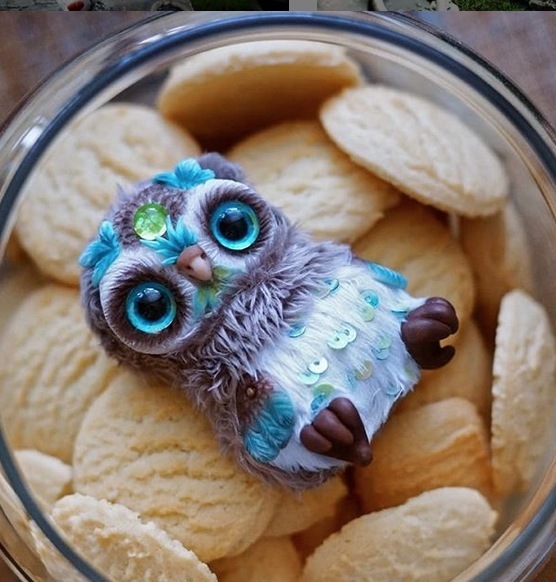 Oh those little owls are adorable! Thank you for adding more art to my IG. I would love to be entered for all 3. Man that octopus chandelier is awesome. I think at night it would possibly make people jump if they didn't know about it beforehand. those all look great to me. I wish I could draw anything as good as these artist. I'm amused that that first doll face picture made me go "ooooh" and then I scrolled and saw that was your caption for it, lol! That tiny owl is adorable, and THE WITCHES. That one in the middle is clearly an Ogg. Please enter me for the Baby Vader, please! Pretty please can I win Baby Vader? Holy moley, baby Vader is sooo squee! Thank you for always finding these amazing artists.